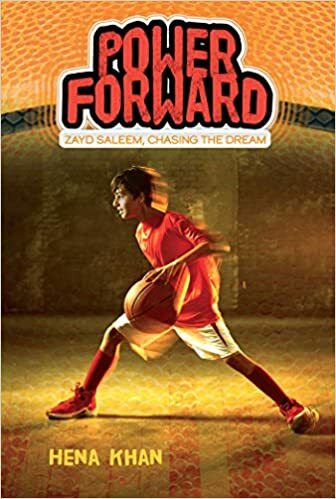 Summary: Fourth grader Zayd dreams of making the gold team in basketball, but he feels like he’s got a long way to go. For one thing, he’s the shortest kid in his class and weighs less than 60 pounds. For another, his mother is thrilled he’s been asked to join advanced orchestra and is certain his future lies with playing the violin. When Zayd discovers his friends are coming to school early for extra basketball practice, he makes up a story to skip early-morning orchestra and plays with them instead. His mom catches him eventually, and Zayd is grounded for two weeks…with basketball tryouts just nine days away. Zayd is sure he’s doomed to play another season on the D team until his uncle gives him some useful advice about how to follow his dream. 144 pages; grades 2-5. Pros: An exciting, true-to-life sports story with interesting glimpses into Zayd’s Pakistani-American family and their culture. Matt Christopher fans not quite ready for Mike Lupica will enjoy getting to know Zayd and can look forward to at least two more books in this series. Cons: Readers may wish for a little more actual sports action. It looks like this may be coming in book 2.